Rashida wrote in to share an in-progress photo of her master bedroom. She was inspired by the panelled wall in our master bedroom. Doesn't her panelled wall look great? The scale is perfect; I like the symmetry. Can't wait to see the room all finished! Have you been inspired by something here at Rambling Renovators? Do let me know at ramblingrenovators@gmail.com. I'd love to see your work! Of course I have been- like a million times! I want to panel my whole bedroom but am totally chicken to do it myself- we'll see;) Have a great week Jennifer!! I love it... she did a great job... and of course had some seriously great inspiration. Everything you guys do inspires me! I wish we have rooms in our home that we could panel like this! ;) Maybe our next one! Looks fantastic! I love the height it gives the room. Fabulous job! i just discovered your blog, and i love it! very inspiring! 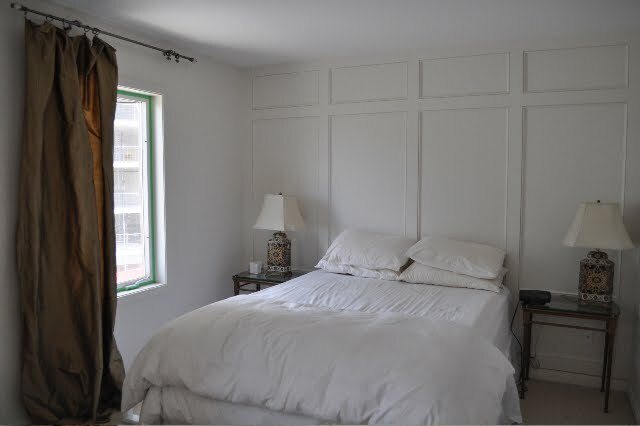 What a great job - I've always loved paneled walls! Can you believe I just stumbled upon your blog??? I mean, where have I been - under a rock somewhere?? Wow! This is amazing. So beautiful and serene but interesting at the same time. Nice!! I love your blog. We just renovated our house. Going to check out more of your posts. So excited to be following you now...love your nursery and office! Great job. As a builder, renovator and Realtor I help clients imagine what a room can look like with a little enhancement or updating. There are so many bargains on outdated, older homes these days that renovating is the cost effective way to get the most home for the dollar. This sure inspires me! I've been trying to think of a way I could create a focal point in the bedroom. Mike - great inspiration pics! Looking forward to your basement reno. Rashida has done a great job on her bedroom wall. Kudos to her for taking on the paneling project!! And thanks to you and Mr. HandyMan for being such an inspiration to so many. Very inspiring. Never though something as simple as paneling a wall could look so elegant.